I cannot get over this piece because of the huge display it holds and the low price for such a statement making piece of jewelry. This shade of tourmaline tiptoes on the edge of pink and red, making it a breathtaking deep pink, which is a rare color to see. This STUNNING Rubellite Tourmaline measures approximately 10 carats. 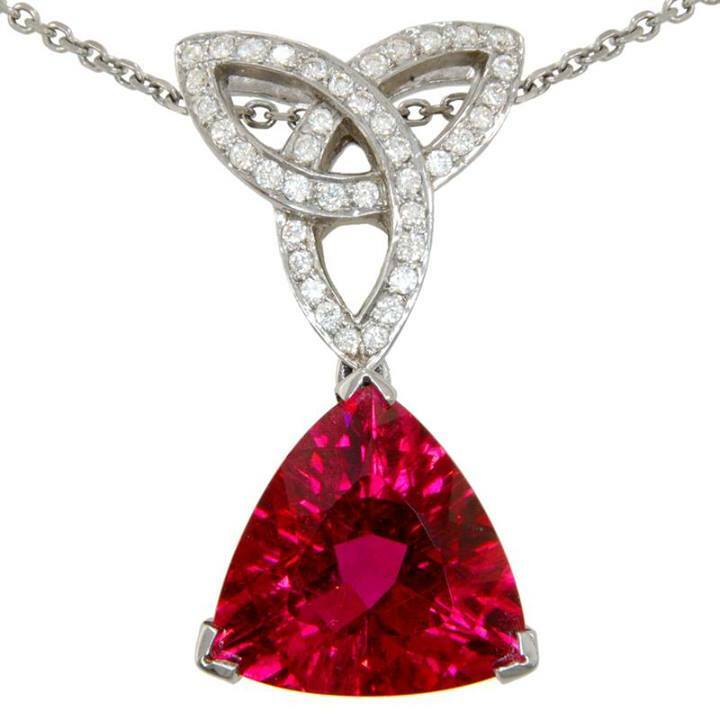 Rubellite, definines the brilliant dark pink color that any girl is sure to fall in love with. The trillion cut stone dangles delicately from a trinity knot diamond bail which slides gracefully along the chain. The bail also features a hidden diamond on each side, although with the sparkling display they are far from hidden. Not only are these diamonds beautiful but they are of great quality. Total diamond weight measures approximately .68 carats with clarity ranging VVS1-VS2. The pendant and chain are 18 karat white gold and the design was put together by Mark Scheider.